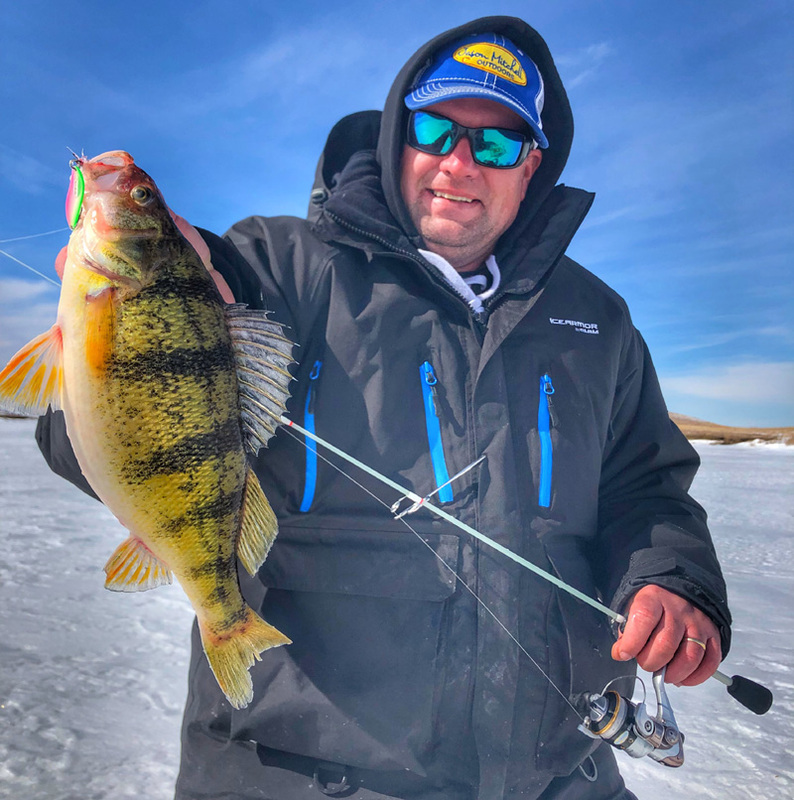 Ice anglers have long been infatuated with big jumbo perch and late ice is a prime window for targeting perch on a lot of different fisheries. In some states, game fish seasons close prior to the late ice period where as perch and other pan fish seasons remain open year-round. Part of the allure for ice anglers targeting perch can be the highs and lows of perch fishing in that we often need to move and drill holes to find fish. A frustrating day can change in a matter of minutes with one hole… one school of fish. You can go from a zero to a hero quickly when fishing for perch. The randomness of where we find perch can be frustrating in that on so many fisheries, we are finding schools of perch wandering basins and large flats. Perch can be anywhere on these locations and are often moving. As a result, finding and catching perch is often about moving and drilling holes. You don’t catch perch until you find them. There are many nuances however that can affect that overall strategy. Breaking down basins and large flats is often about making big moves until you find some signs of life and then making small moves to catch fish. This is a mistake that many anglers make is that they get bogged down with drilling a lot of holes but drilling their holes too close together on foot. When you are on a large piece of structure, use your ATV, snowmobile or vehicle to make those big moves. Don’t plop on a location, unload all your gear and proceed to tear apart the lake within a hundred yards of you when in search mode unless you are extremely lucky. My best strategy for finding fish is making big moves, often traveling two to three hundred yards between holes and spending more time in a hole, perhaps ten to fifteen minutes. By spreading your holes and settling into your holes longer, you also give fish a little bit of time to wander underneath you if you are in a productive area. This style allows you to break down bigger pieces of water and allows you to cover miles of water over the course of the day when you are starting from scratch. Jason Mitchell explains some mindsets and strategies for breaking down ice to find jumbo perch. There are many factors to try and wrap your head around when dialing in patterns but perhaps the most important factor is how to drill out a location and the overall strategy of using your auger to catch fish. Perch can be in one massive school that is moving a general direction or the school can be several small pods or waves of fish that are traveling a general direction. On some fisheries, perch will school in a column where they stack up on top of each other and move very fast. These vertical schools are typically very aggressive fish and these fish will often climb much higher in the water column. There are also times where perch will seldom stack up vertically and instead school up where the fish swim side by side and you seldom have more than three fish on the Vexilar at one time. These horizontal schooling fish are often less aggressive and sprawl out over a larger area. Generally, if you can get fish to stack up on top of each other and get multiple fish below you… these fish are much easier to catch. Understanding some of these factors can help you make much better decisions on the ice when targeting perch at late ice. Your process of looking for perch and how to target these fish once you find them in all reality trumps everything else. What you do with your auger can often be much more important than presentation details. Late ice is perhaps one of the most coveted periods of time for ice anglers targeting perch. When breaking down large basins and flats that can be somewhat intimidating… big moves find fish but the small moves catch them.